If you follow this blog regularly, then you know that I have an obsession with the color blush. 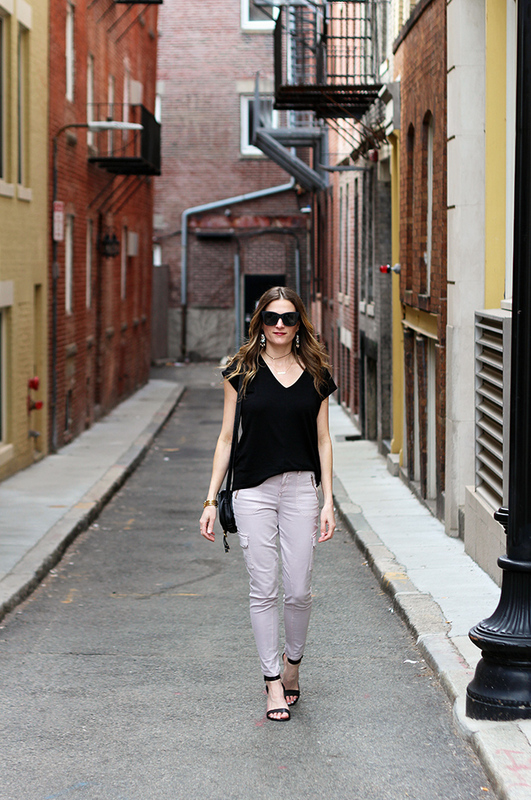 When these blush cargo pants arrived in my latest Stitch Fix shipment, it is no surprise that they were the first thing that I had to try on. I have actually been wanting to add a pair of blush pants to my wardrobe, so I was excited that these were picked for me, despite that fact that I'm not a huge fan of the cargo style. Although I did find these cargo pants to be cute on, especially paired with this black Market & Spruce tee, also from my shipment, I wasn't one hundred percent in love with the fit. They were a tad too loose in the legs, and I know that exchanging them for the size down would then make them too tight in the waist (#appleshapedproblems). In fact, if I am being honest, nothing from this shipment blew my socks off, which is definitely a first. I've always had the best of luck with my Stitch Fix boxes, and usually want to keep everything that is sent. But I guess one shipment that I don't love out of six is not so bad, and I can't wait for my next one. I'll be sharing the other items in my fix on Friday, along with letting you know if I actually kept anything, so make sure to visit back then. In the meantime I am going to update my style profile (see these tips here for getting a perfect Stitch Fix box each time), and I'll be on the hunt for the perfect blush pant. You can see my last two Stitch Fix reviews here and here. I love how you paired the darker top with a neutral pant. Those pants were totally made for you too! Such a great fit. Have a good week! These pictures are gorgeous Rachael! I've never tried Stichfix, but i've heard many great things. Your blush pants are too cute! 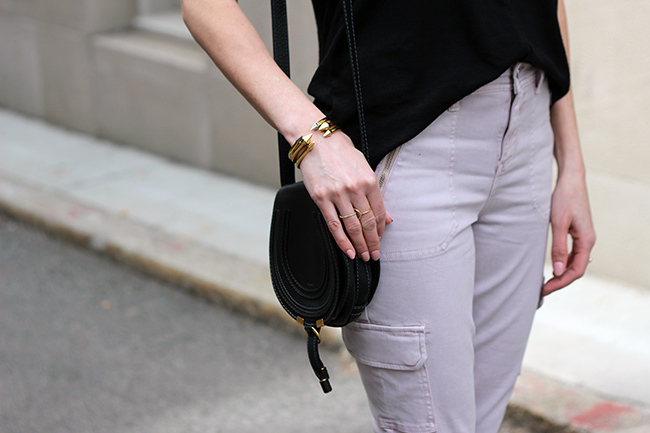 Love these blush cargo pants!! So pretty! I love how you styled these cargo pants! So chic and feminine! I love Stitch Fix! These pants fit you perfectly! Those pants are adorable! Too bad they didn't fit, but I know what you mean. I don't settle on fit for pants anymore because otherwise I won't wear them. Hopefully the next box is better! I love that top and how you can style it off-the-shoulder too! Great pants but I love the shoes! Such a pretty pair of cargo pants! I love it styled with the black top, shoes, and accessories! So chic and pretty! So stylish cargo, dear. Love your casual outfit. What a chic casual look! I love it and you look gorgeous! - Happy Friday dear! I love blush and black! And the blush cargo pants are super cool. Feminine and edgy all at once. So my style! You look fabulous!